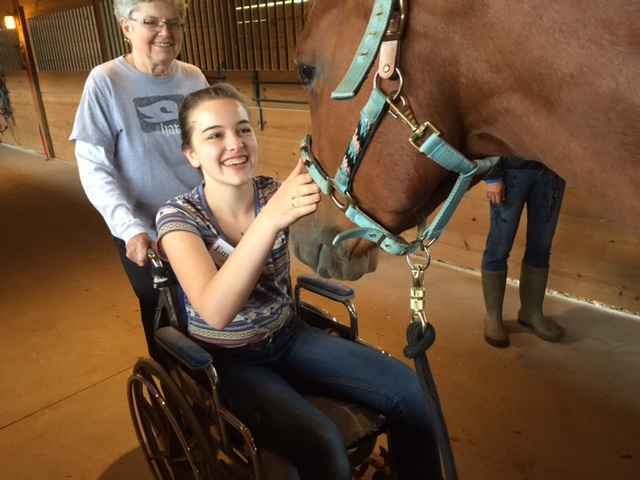 Baraboo River Equine-Assisted Therapies Inc - Helping the disabled find freedom and confidence on horses. Help us change lives, one ride at a time! Your generous support will help BREATHE continue to offer its high quality therapeutic riding program to the special-needs community. Provides 3 bales of hay! Provides 2 bags of grain! If you want to feel good...Do Good! A rider who I will call "Roberto" is a perfect example of the benefits available through participation in the therapeutic riding program at BREATHE. Roberto is a tfourteen year old boy who has cerebral palsy. Roberto needs physical therapy consistently in order to remain mobile on his feet and avoid surgery. He finds his physical therapy difficult and boring, but loves his therapeutic riding sessions. During his weekly riding session, Roberto is able to experience the freedom and mobility of therapeutic riding, which helps him loosen his spastic muscles. So far his riding sessions have helped in warding off the need for surgery! After his second riding lesson, Roberto's mom remarked "Do you see it?" She was referring to his lengthened legs and more upright posture. "It will last for three days!" she said. Roberto is a huge automobile fan, especially anything diesel. In addition to the benefits of the physical therapy, is the valuable time Roberto spends talking automobiles with our volunteers each week. While Roberto gains much from his involvement at BREATHE, Roberto's father also remarks at how much he enjoys his experience at the ranch. Not only does Roberto's father enjoy walking the trail with his son, he also appreciates the acceptance and positive atmosphere that greets his son each week.. Finally, he values the opportunity to speak with the parents of other riders who understand his unique challenges, and can help him with his problems. Sometimes he feels that he is benefiting as much as his son. We are grateful to help this amazing organization! Bless you for choosing to serve in this impactful way! Wish I could donate more. Great organization. I'm a Civil war reenactor. I put on programs for elementaty and middle-school students to show them what life was like for soldiers in the 1860s. In celebration of the 61st Birthday of Marc Reed. Happy Birthday to ME! And a Happy Day to your riders! You enhance life to those who need it most.